Folio, uniform, contemporary limp vellum. Watermark in both text and maps and in both the Flamenco volumes as in the de la Cuesta volumes: cross in an oval (45x30 mm) with B F and A D and possibly other letters hanging under it. Compare Piccard, cross, 653 and 654, Torino 1606 and Lucca, 1617 respectively. Title in manuscript on the spine, an integral authentic set. Two of the nine title pages from a 1726 copy with the date corrected in manuscript, one engraved title page missing (book VIII). Engraved title page of book III remargined. The atlas (Descripcion) bound after book IV in Volume two, but complete and original. Two text leaves missing from book VIII. Some of the fly leaves renewed, a small tear repaired in a few places. Slight browning in the first books. Overall a healthy copy, printed on very white paper. An original set in its original condition. Book I: Engraved title page; 372 pp; 11 nn lvs (missing a last blank??). Book II: Engraved title page; 368 pp. ; 8 nn lvs. 1521-1526: Cortes; Magellan; Pizarro; Loayza. 318 pp; 1 original blank plus 10 nn lvs. 1532-1535: Pizarro al Alvarado en Chile. Book VI:, 2 nn lvs, including engraved title page; 302 pp; 1 plus 8 plus 1 nn lvs. 1536-1541: Federmann; Jimenez de Quesada; de Soto; Núñez Cabeza de Vaca. Book VII: 4 nn lvs including engraved title page; 316 pp; 10 nn lvs. 1541-1546: Almagro; Gonzalo Pizarro; Núñez Cabeza de Vaca. 1546-1554: Desde Gonzalo Pizarro hasta el final de las guerras civiles del Peru. 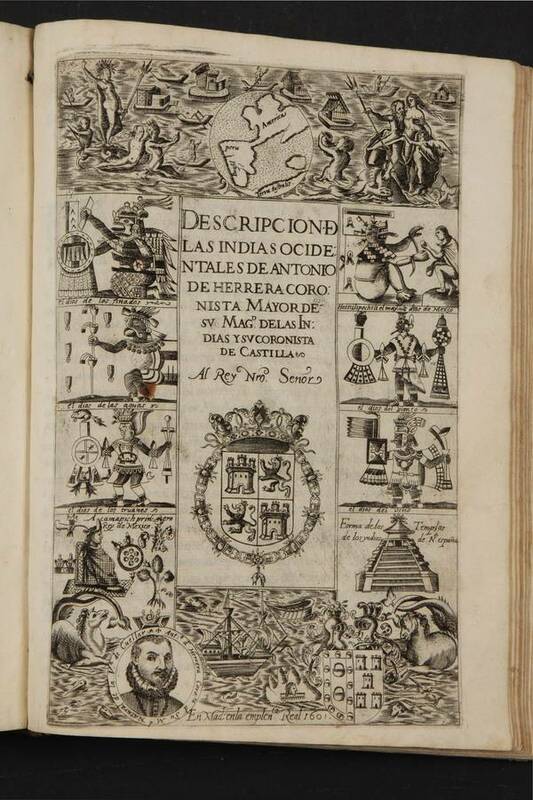 Spain has a rich history of documenting its conquistas en las Americas and these were usually published (if censored), in contrast with the Portuguese practice. Columbus letter had 17 editions in 4 languages before 1500. Pedro Martir published his decadas since 1511 and completed them in 1532. They were translated and widely read in Europe. Gonzalo Fernandez de Oviedo published the first part of his Historia general de las Indias en 1535, and de las Casas his own in 1552. In that same year, 1552, Fernando Lopez de Gomara published his Historia general de las Indias y de Mexico in Zaragoza. Antonio de Herrera was named Cronista mayor de las Indias in 1596. His task was to document the conquest of the Americas by Spain. He did so in a very detailed manner and based on an official point of view. The text is published in 8 books, each of 10 chapters (las decadas) covering the period between 1492 and 1554. (Kagan, 2010, pp 244-263). The work describes nearly on a daily basis the voyages and actions of Coloumbus, Cortes, Pizarro and all the other Spanish conquistadores. Decada VII, book 6, chapter 5 gives the complete text of the Leyes de Indias, the set of laws Spain designed for the Americas. In 1542. Herreras work is still the main source for research into the birth of the Spanish empire. The Descripcion is a separate book. It is an atlas of the Americas, that is description of the countries involved and the corresponding maps. This is the second atlas (only) to be exclusively dedicated to the Americas, the first being the Wytfliet (1597). i) Contrary tof or example de las Casas who with his Brevisima relacion de la destruccion de las Indias gave a personal interpretation of the same events.